Featuring all 26 episodes of Tokyo Underground that is a whopping 650 minutes in length, this is the penultimate collection of the series. With big anime eyes, over the top acting and storylines, this is the cliché of anime that at the end of the day (or month) is a great entertaining series that contains action, humour and excitement. The tale revolves around three characters that include Chelsea Rorec, Ruri Sarasa and Rumina Asagi who band together to fight the forces of evil. The series begins with Rumina Asagi, a kind of high school hero who upon returning home discovers that two girls have hidden themselves inside his grandfathers home. When more strangers make themselves known and the nefarious Seki who is hell bent on destroying Chelsea and Ruri, Rumani heroically defends them... unbeknown to him that these two girls also have powers of their own. The battles are quite entertaining to watch and as the series progresses, we soon learn Rumina has the ability to control the winds. We also learn that these "humans" with super powers were actually from Tokyo Underground that was closed the surface world due to a dark company which researched on these beings. From here, the trio are on a journey of liberation, discovery and a climatic conclusion which threatens the very fabric of mankind. 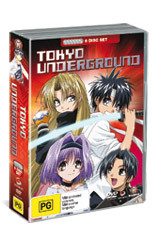 The characters of Tokyo Underground are quite relatable and even though some of the episodes are quite predictable, the series is still an enjoyable roller coaster ride from start to finish and for a price of $59.95, there is little to complain about 650 minutes of pure anime goodness!